The B Sixth Avenue Express is a rapid transit service in the B Division of the New York City Subway. Its route emblem, or "bullet", is colored orange since it uses the IND Sixth Avenue Line in Manhattan. The B operates on weekdays only, servicing between 145th Street in Harlem, Manhattan and Brighton Beach in Brooklyn, making express stops in Manhattan (between 34th and West Fourth Streets) and in Brooklyn and local stops between 145th and 59th Streets in Manhattan. During rush hours, service extends beyond 145th Street and originates and terminates at Bedford Park Boulevard, making local stops in the Bronx. The B does not operate during late nights. The B used to run almost exclusively in Manhattan, from 168th Street in Washington Heights to 34th Street–Herald Square in Midtown Manhattan. In 1967, with the Chrystie Street Connection, the B started running via the BMT West End Line (local) and BMT Fourth Avenue Line (express) in Brooklyn. A short-lived yellow B service ran via the BMT Broadway Line in Manhattan and the BMT West End Line in Brooklyn from 1986 to 1988 due to Manhattan Bridge renovation, while orange B service traveled the pre-1967 route between 168th and 34th Streets. After 1989, the B north of 47th–50th Streets–Rockefeller Center used the IND Eighth Avenue Line to 168th Street on weekdays, and the IND 63rd Street Line on evenings and weekends. Late night service ran as a shuttle on the West End Line. Weekday service was rerouted to the Concourse Line in 1998, while off-peak service along 63rd Street ceased in 2000. The B started using the Brighton Line in 2004 after work on the north side of the Manhattan Bridge was completed. The designation B was originally intended for express trains originating from the Washington Heights neighborhood of Manhattan and operating in Midtown Manhattan on the IND Sixth Avenue Line. 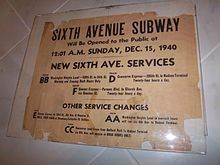 However, the original B service, beginning with the opening of the Sixth Avenue Line on December 15, 1940, ran as a rush-hour only local service between 168th Street–Washington Heights and 34th Street–Herald Square. This service was designated BB, conforming with the Independent Subway System (IND) convention using double letters to indicate local services. The Chrystie Street Connection and the express tracks of the Sixth Avenue Line opened on November 26, 1967, radically changing service. BB trains were combined with the former T service, which ran on the BMT West End Line in Brooklyn and the BMT Broadway Line in Manhattan. This created a through service from 168th Street to Coney Island–Stillwell Avenue via the Sixth Avenue Line express tracks and the Manhattan Bridge. During middays, service to and from Brooklyn terminated at West 4th Street. During late night hours and Sundays when B service did not operate, TT shuttles continued to operate on the West End Line. On July 1, 1968, the B was rerouted to terminate at 57th Street in Midtown Manhattan during middays and evenings, extending to 168th Street only during rush hours. The West End Line shuttles were also made part of the B route. On June 1, 1976, the New York City Transit Authority (NYCTA) announced changes in subway service that were expected to save $12.6 million annually and were the third phase of the agency's plan to realign subway service to better reflect ridership patterns and reduced ridership. As part of the changes, which took effect on August 30, 1976, B service began running between 57th Street and Coney Island during all times, replacing K service, and alternate B trains commenced operating between 168th Street and Coney Island during rush hours. On December 14, 1976, the NYCTA announced severe cuts in bus and subway service in order to cut its budget by $30 million over the following 18 months in order to achieve a balanced budget, at the request of the Emergency Financial Control Board. As part of the cuts, late night B service was cut back to running as a shuttle between 36th Street and Coney Island via the West End Line. This change took effect on August 27, 1977. Initially, the 57th Street station was to be closed during late nights. However, a B shuttle also operated during late nights, running between 47th–50th Streets–Rockefeller Center and 57th Street. The NYCTA approved four changes in subway service on April 27, 1981, including an increase in B service. The changes were made as part of the $1 million, two-year Rapid Transit Sufficiency Study, and were expected to take place as early as 1982, following public hearings and approval by the Metropolitan Transportation Authority (MTA) board. As part of the changes, midday B service was going to be increased, replacing AA service. B service on the West End Line and Fourth Avenue Line express was to be supplemented by a new rush hour T train, running between Bay Parkway and Chambers Street on the Nassau Street Line. On June 1, 1983, the NYCTA proposed changes to increase service along Sixth Avenue and better connecting the line to the Bronx and Queens. As part of the changes, B train service would run to 168th Street at all times, with service to 57th Street during non-rush hours replaced by a new H train running between 57th Street and World Trade Center. With the extension of B service to 168th Street, AA service would be eliminated. The changes would have gone into effect in spring or summer 1984, pending approval by the MTA board. 1986–1988 bullets for BMT Broadway Line service; the diamond was for rush-hour service to Astoria–Ditmars Boulevard. The reconstruction of the Manhattan Bridge between 1986 and 2004 affected B service as the bridge's north side tracks, which led to the Sixth Avenue Line, were closed multiple times. These closures severed the connection between the northern and southern portions of the route. B service was split into two different services starting on April 26, 1986, with an expected completion date of October 26, 1986. The closure of the bridge's north side tracks caused the return of pre-November 1967 service patterns, before the opening of the Chrystie Street Connection: The orange B duplicated the former BB service, and the yellow B imitated the old T service. The northern B service ran via Sixth Avenue, using an orange bullet, between 34th Street-Herald Square and 168th Street during rush hours only. The southern B service ran via the bridge and BMT Broadway Line, using a yellow bullet. It ran from Coney Island-Stillwell Avenue and terminated at Astoria–Ditmars Boulevard rush hours, Queensboro Plaza middays, evenings and weekends and 36th Street late nights as a shuttle. Service to 57th Street and Grand Street was replaced by a S shuttle running between these two points, running via the Sixth Avenue local. On May 24, 1987, evening and weekend Broadway Line B service was cut back from Queensboro Plaza to 57th Street–Seventh Avenue. Through B service on the Sixth Avenue Line resumed December 11, 1988, when the Manhattan Bridge's north side tracks reopened. Due to increased demand for Sixth Avenue service along Central Park West, B trains were extended to 168th Street on middays and evenings, partially replacing the discontinued K service. :17 During late nights, the B continued to operate as the West End Shuttle from 36th Street to Coney Island. B service operated to 57th Street during weekends and N service was increased to replace B service to Ditmars Boulevard. With the opening of the IND 63rd Street Line on October 29, 1989, B service was extended from 57th Street to 21st Street–Queensbridge on weekends. On September 30, 1990, evening service was rerouted to 21st Street–Queensbridge to replace Q service with A service running local between 145th and 168th Streets in its place. B trains stopped operating between 47th–50th Streets–Rockefeller Center and 168th Street between 8:15 p.m. and 6:45 a.m., saving the NYCTA $1.35 million annually. Also on this date, because N service resumed running via the Manhattan Bridge, B trains began skipping DeKalb Avenue. The north side of the Manhattan Bridge closed on middays and weekends from April 30, 1995 until November 12, 1995, during which B trains ran only between Pacific Street and Coney Island–Stillwell Avenue, running local on the BMT West End Line and express on the BMT Fourth Avenue Line. From February 22, 1998 to May 22, 1999, B service was cut to 57th Street on evenings and weekends due to track and tunnel reconstruction of the IND 63rd Street Line. Service on that line was replaced by a shuttle to the BMT Broadway Line which ran every 20 minutes. The 57th Street station was closed from 12:30 to 6 a.m. daily during the project. The project had initially been slated to be completed in fall 1999, but normal service resumed in May 1999, ahead of schedule. The B and the C switched northern terminals on March 1, 1998, ending the connection between the B and Washington Heights. The B was routed onto the IND Concourse Line to Bedford Park Boulevard during rush hours. Midday service terminated at 145th Street. The change was made to reduce crowding on the C and to reduce passenger confusion about the C's route. In 2000, B service was taken off of the IND 63rd Street Line for signal and track work. It ran along Central Park West to 145th Street (terminating at Bedford Park Boulevard during rush hours) at all times except late nights. On July 22, 2001, the Manhattan Bridge's north side tracks closed and B service over the Manhattan Bridge was split into two services once again, similar to the 1986 changes. This time, the southern half of the route, which runs on the Broadway Line, was named the W. B service ran weekdays only, from 34th Street to Bedford Park Boulevard during rush hours and from 34th Street to 145th Street during middays and evenings. The Manhattan Bridge was fully reopened to subway service on February 22, 2004. B trains were once again extended through Grand Street station and over the bridge's north tracks into Brooklyn. Now service operated between Brighton Beach and Bedford Park Boulevard during rush hours and Brighton Beach and 145th Street on weekday middays and evenings. The B now served the BMT Brighton Line in Brooklyn as the express (replacing the <Q>), instead of the West End Line, which it had served in some form since 1967 to combine two weekday-only services. From September 14, 2009 to October 3, 2011, B trains ran local in Brooklyn due to station renovations on the Brighton Line. ^ a b "B Subway Timetable, Effective June 24, 2018" (PDF). Metropolitan Transportation Authority. Retrieved June 24, 2018. ^ "Line Colors". mta.info. Metropolitan Transportation Authority. Archived from the original on October 16, 2016. Retrieved October 30, 2016. ^ "The New Subway Routes". The New York Times. December 15, 1940. ISSN 0362-4331. Archived from the original on April 16, 2018. Retrieved June 20, 2016. ^ "New Subway Routes Brochure". New York City Transit Authority. November 1967. Archived from the original on December 8, 2015. Retrieved January 24, 2016 – via The JoeKorner. ^ "New York City Subway Map and Guide 1967". New York City Transit Authority. 1967. Retrieved March 29, 2019 – via subway.com.ru. ^ Hofmann, Paul (July 1, 1968). "Skip-Stop Subway Begins Run Today – KK Line Links 3 Boroughs – Other Routes Changed". The New York Times. ISSN 0362-4331. Retrieved November 27, 2016. ^ "Service Adjustment on BMT and IND Lines Effective 1 A.M. Monday, Aug. 30". Archived from the original on January 5, 2017. Retrieved October 23, 2016 – via Flickr. ^ Raftery, Thomas (June 2, 1976). "Some Lines Derailed In Plan for Subway". New York Daily News. Retrieved March 29, 2019. ^ Hirschfeld, Neal; Patterson, Michael (December 15, 1976). "TA Cuts Subway, Bus Service Jan. 1". New York Daily News. Retrieved March 29, 2019. ^ "Angry Riders Blast TA Cuts". New York Daily News. January 6, 1977. Retrieved March 29, 2019. ^ "Service Adjustments on the BMT and IND Lines Effective Midnight, Saturday, August 27 New York City Transit Authority (1977)". Archived from the original on September 15, 2016. Retrieved June 9, 2016 – via Flickr. ^ "Still Take The A Train". New York Daily News. December 15, 1976. Retrieved March 29, 2019. ^ McFadden, William (August 22, 1977). "Night Service Subway Cuts Start Sunday". New York Daily News. Retrieved March 29, 2019. ^ Edmons, Richard (April 28, 1981). "TA approves four route changes. 2-year subway study affects only the IND/BMT division". New York Daily News. Retrieved March 29, 2019. ^ Harney, James (June 2, 1983). "TA eyes big Sixth Ave. beef-up". New York Daily News. Retrieved March 29, 2019. ^ a b Washington Heights, Central Park West And Grand Concourse Riders Your Guide To Service Changes On The B D During Rehabilitation Work April 26 Through October 26, 1986. New York City Transit Authority. April 1986. ^ "If You Ride These Subway Lines, You Know Something Drastic Has To Be Done". New York City Transit Authority. 1986. Archived from the original on May 10, 2017. Retrieved October 30, 2016 – via The JoeKorner. ^ "Announcing Service Changes On The N and R Routes Beginning May 24, 1987 New Routes Mean Better Service". New York City Transit Authority. May 1987. Archived from the original on August 19, 2016. Retrieved April 23, 2018 – via subwaynut.com. ^ "System-Wide Changes In Subway Service Effective Sunday, December 11, 1988". Archived from the original on September 15, 2016. Retrieved June 17, 2016 – via Flickr. ^ "October 29, 1989 Subway Map". New York City Transit Authority. October 1989. Retrieved October 7, 2018 – via Flickr. ^ "Announcing New Subway Service Between Queens And Manhattan. Starting Sunday, October 29, 1989". New York Daily News. October 24, 1989. Retrieved March 29, 2019. ^ Introducing the new 63 Street Extension Opening 29, 1989. New York City Transit Authority. October 1989. ^ Siegel, Joel (September 28, 1990). "We will be missing some trains, sez TA". New York Daily News. Retrieved March 29, 2019. ^ "Service Changes September 30, 1990" (PDF). New York City Transit Authority. September 30, 1990. Archived (PDF) from the original on October 26, 2014. Retrieved May 1, 2016 – via subwaynut.com. ^ "September 30, 1990 Subway Map". New York City Transit Authority. September 1990. Retrieved October 7, 2018 – via Flickr. ^ Belluck, Pam (November 13, 1995). "For Riders, A Bright Spot Amid Tumult". The New York Times. ISSN 0362-4331. Retrieved March 29, 2019. ^ Ronald Sullivan (March 26, 1995). "Bridge Repairs to Disrupt Off-Peak Subway Service". The New York Times. Archived from the original on August 19, 2016. Retrieved July 2, 2016. ^ "March 1, 1998 B C Routes are switching places above 145 St". New York City Transit. March 1998. Archived from the original on January 5, 2017. Retrieved October 23, 2016 – via Flickr. ^ "The B and C routes will switch places above 145th Street beginning March 1". New York Daily News. February 23, 1998. Retrieved March 29, 2019. ^ "Weekly Subway Service Advisories Updated Nov 9, 2000". mta.nyc.ny.us. Metropolitan Transportation Authority. November 9, 2000. Archived from the original on November 9, 2000. Retrieved April 2, 2019. ^ "Manhattan Bridge Service Changed B D Q W" . Metropolitan Transportation Authority. July 2001. Retrieved March 29, 2019 – via The JoeKorner. ^ "B D S Manhattan Bridge Service Change Train Timetable" (PDF). mta.info. New York City Transit. April 2003. Archived from the original (PDF) on June 29, 2003. Retrieved October 30, 2016. ^ "Manhattan Bridge Service Changes". The New York Times. July 21, 2001. Archived from the original on July 3, 2018. Retrieved July 31, 2018. ^ "A Subway Map Remade, in Hopes of Matching Routes and Riders". The New York Times. February 20, 2004. Archived from the original on July 15, 2014. Retrieved June 9, 2014. ^ "More Service on the Manhattan Bridge B D M N Q R W New Subway Service! February 22, 2004". The JoeKorNer. New York City Transit. 2003. Archived from the original on July 15, 2014. Retrieved August 5, 2010. ^ "B Train Timetable" (PDF). mta.info. Metropolitan Transportation Authority. January 18, 2010. Archived from the original (PDF) on March 31, 2010. Retrieved October 30, 2016. ^ "B Express Service Returns to the Brighton Line". mta.info. Metropolitan Transportation Authority. September 30, 2011. Retrieved March 31, 2019. ^ "Brighton Line Station Rehabilitation" (PDF). The Bulletin. Electric Railroaders' Association. 52 (10): 18. October 2009. Wikimedia Commons has media related to B (New York City Subway service). "B Subway Timetable, Effective June 24, 2018" (PDF). Metropolitan Transportation Authority. Retrieved June 24, 2018. This page was last edited on 3 April 2019, at 15:28 (UTC).